Established more than 40 years ago in the Okanagan area of British Columbia, Mervyn’s prides itself on providing the highest quality repair and customer satisfaction. “It’s all about staying on top and being the best we can be for us and for the customer,” said Jason Agostino, owner of Mervyn’s. “Symach’s equipment is helping us fulfill that.” Mervyn’s The Body Shop is a very old Kelowna company purchased by Peter Facinek in the early 2000s. 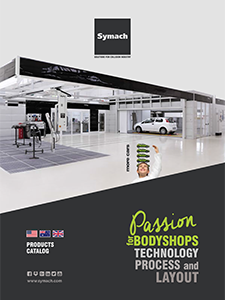 Agostino came on board as the body shop manager soon after and became co-owner of the business. Since then, he has run the shop on a day-to-day basis with Facinek as a consultant and silent partner. Agostino’s wife, Rosy, also helps in the business. The owners always planned to open a new location and over the last several years, they have been working on the design. During this time, they found out about Symach equipment from attending an AkzoNobel Acoat Selected performance group meeting. “We are continually investigating newer and better ways to repair and finish damaged vehicles to ensure that customers are 100 percent satisfied,” he said. “We learned that Symach builds exactly what we were look for,” said Agostino. Facinek first went to Ontario to visit another collision repair facility using the equipment and then traveled to Italy to see Symach’s operation first-hand. Following that trip, Mervyn’s decided to purchase Symach’s FixLine system, two Fly dry robots and one easy dry robot in addition to five lifts. “We already had the layout designed for the new location,” said Agostino. “Symach modified it to fit the equipment and we decided to buy the whole package rather than try to piecemeal everything together.” It was installed in November 2017 and Symach trained all of the technicians. It has been operational since February. “We’ve always used team systems and run a processed-centered environment using other tools, so it was a smooth transition for us to use Symach’s quality equipment,” said Agostino. The baking equipment uses a slightly different application, but he has found that it has been working out well. Although they are still in their infancy stages using Symach’s equipment, they have found it has already helped with cycle time in the shop. “What used to take us one and a half hours, now takes 20 minutes,” said Agostino. “You don’t have to wait for dry times. They told us that, but you never really believe it until you see it.” Since installing the equipment, Agostino said it has helped the shop stay cleaner and it’s a nicer environment for his 13 employees to work, many of whom have worked there long-term.